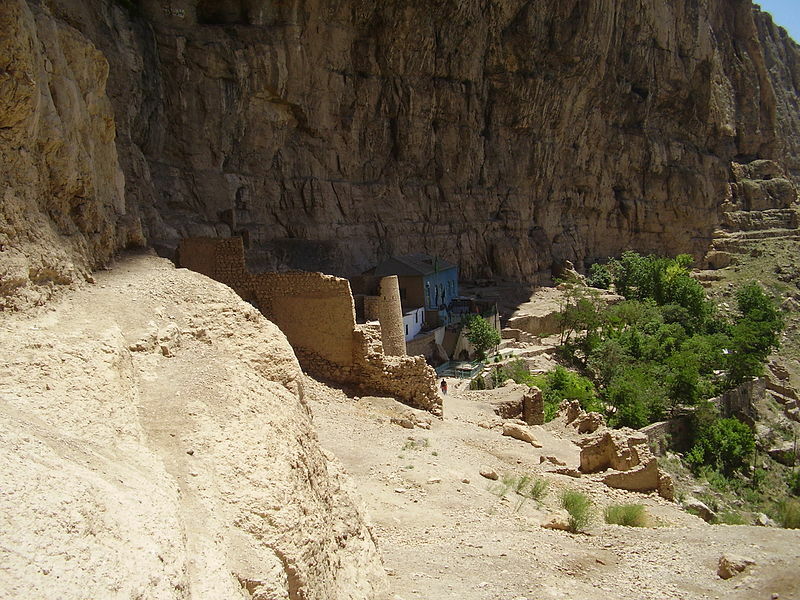 In April, 1848, the authorities moved the Bab moved to an even more remote prison fortress in northwestern Iran, Chihriq, which He called the “Grievous Mountain”. Soon the officer in charge, the local people, and the important clerics in the region were moved by the Bab’s holiness. A seeker travelled all the way from India after having seen Him in a dream. The authorities decided that the Bab had to be put on trial. All along the road, the Bab’s presence generated excitement as stories of his miraculous deeds were spread among the people. The most prominent clerics in the area and the future King gathered to question the Bab. The astonished clerics responded with a series of very specific questions on obscure issues not related to the Bab’s claims. A cleric asked that he describe the trial in Qur’anic language, and just as the Bab began to do so, he was cut off by his questioner who mocked him His highly unconventional Arabic. At that point the Bab uttered the Qur’anic verse, “Far be the glory of thy Lord, the Lord of all greatness, from what they impute to Him, and peace be upon His Apostles!” He then got up and walked out of the trial which descended into chaos. Both the Bab and Jesus were put on trial. Both proclaimed the Kingdom of God. Both possessed extraordinary wisdom as youth. Both had brief and turbulent ministries. Both were transfigured. Both were executed. Both gave a mission to their apostles. “Then the eleven disciples went to Galilee, to the mountain where Jesus had told them to go. When they saw him, they worshiped him; but some doubted. Then Jesus came to them and said, "All authority in heaven and on earth has been given to me. Therefore go and make disciples of all nations, baptizing them in the name of the Father and of the Son and of the Holy Spirit, and teaching them to obey everything I have commanded you. And surely I am with you always, to the very end of the age." In the year before Seneca Falls, the Bab’s influence in Iran had spread so much that the authorities had him moved him to the far northwest near the border with Russia and shut him up in a mountain prison. A lone path connected its front gate to the town of Mahku at the foot of the mountain. On the way to their fields in the morning, the local Kurdish farmers often stopped to look up at the mountain prison hoping to receive a blessing from the holy man within. The very presence of the Bab affected the warden and the guards. After seeing the Bab in a vision walking outside the castle, the warden relaxed all the rules pertaining to the prisoner and allowed the growing stream of visitors to come in and meet him. During the bitterly cold winter of 1847-8, the Bab revealed in his dark stone cell his Holy book, the Bayan (the ‘Exposition’). On July 13, 1848, Elizabeth Stanton, Lucretia Mott, and several other women decided to hold their women’s convention in Seneca Falls, NY. Lucretia Mott was the principal organizer of the Convention; Elizabeth Cady Stanton was its driving intellect. On the morning of July 19, 1848, the bumpy roads around Seneca Falls, NY, were crowded with carts and horses coming to the Wesleyan Church. The Convention that began the journey for American women’s suffrage was opened by a man so as not to offend public sensibility. Stanton’s father travelled to Seneca Falls fearing his daughter had gone insane, while his eldest daughter wept over her sister’s involvement in such a gathering. Stanton argued passionately for the right to vote, pointing out that “drunkards, idiots, horseracing rum-selling rowdies, ignorant foreigners, and silly boys.” all could vote—but not women. Other participants, including Lucretia Mott, found this a difficult resolution to adopt. Douglass’ words carried the day and the resolution passed. All the resolutions of the Declaration had been passed by the convention. That evening the Declaration was signed by women and men. But only one of these signatories lived to see the right to vote for women become part of the United States Constitution in 1920. Lucretia Mott (1793-1880) founded the first female anti-slavery society in the world. Born into a Quaker family on Nantucket Island, she learned of the horrors of slavery from the stories she heard. The Motts were so committed to abolitionism that they refused any products made from slave labor and James Mott even changed his business from cotton to wool, a very courageous act in a time when northern businessmen were still very much tied into the southern slave economy. Mott and Elizabeth Cady Stanton went as two of the American delegates to the 1840 London anti-Slavery Convention. Organized by a Quaker, this Convention’s purpose was to fight slavery on a worldwide scale—the British had already outlawed it in general. Women attendees were not allowed to speak—90 percent of male delegates voted against allowing this. Instead, the women were relegated to sitting in the galleries behind a curtain. While walking the streets of London together and discussing the affairs of women, that Mott and Stanton decided to hold a convention for the rights of women when they returned to the United States. That convention would be very long in coming but the fight for abolition would soon succeed. In March, 1848, a movement spontaneously brought thousands of American women into the public arena for the first time: spiritualism. This mass movement began in the unlikeliest of places: the bedroom of two teenage girls who claimed to hear the sounds of knocking. This continued night after night, attracting neighbors and townspeople. Beliefs in ghosts, spirits, and witchcraft were prevalent especially here in the ‘burned over’ district which was the geographical heart of the Second Great Awakening and a center for social reform movements. Soon, meetings were being held regularly called séances, spirit circles. The rapid changes in American society shook the personal faith of many, and spiritualism provided evidence of the continuation of life of loved ones who had passed on. Within months, women emerged who were considered ‘mediums’. The role of the medium came to be seen as feminine with the primary trait being passivity, so that the spirit could work through the woman without the medium’s will interfering. So ‘spiritual’ meant ‘feminine’. The movement was woman-centered and stood in contrast to the established churches. As a result it helped bring focus to the position of women in the country. They became committed to working for the emancipation of women and for women’s advancement in such areas as health and education. This rejection of the status quo also extended to the abolition of slavery. Spiritualists connected freedom for women with freedom for all. Tahirih’s uncle railed from the pulpit against Shaykh Ahmad, the cleric who had foretold the coming of the Bab. One day while her uncle was at prayer, a follower of the esteemed Shaykh felt impelled to avenge the insult and stabbed him. A mob forcibly brought Tahirih and her maid to the governor where she was interrogated. Tahirih’s maid was about to be tortured when news arrived that the killer had turned himself in. Tahirih had played no role in this crime. She was put under house arrest in her father’s house. Her husband and cousins plotted to poison her so she did not eat the household food. This shocking act gave the authorities the perfect pretext for wiping out the Babis. Tahirih’s husband, now the leading cleric of Qazvin, and his associates rounded up prominent Babis and ransacked their homes. Women were also attacked. He had several of the leading Babis of Qazvin killed with great cruelty by mobs in the streets who were incited by clerics while government officials did nothing. These were the first public executions of the followers of the new faith in Persia and included the first Babi—one of Tahirih’s Arab followers—to be martyred on Persian soil. The future persecutions of Babis and Baha’is in Persia followed the pattern in Qazvin—the clerics accused Babis and incited mob violence while the civil authorities allowed the bloodshed to take place to appease the powerful clergy. Click below to see a segment from US news in the 1980s covering the persecution of the Baha’is in Iran. When Tahirih returned to Baghdad in the summer of 1847, her family immediately held a family council. It didn’t go well. The family deeply divided by the Bab’s claims. Her time in the holy cities of Iraq had not brought her back to the traditional faith of her father. To the contrary, she was now acknowledged as a leading Babi teachers by the Bab himself. Her father wanted conciliation between the family members and said that if Tahirih had been born a man and declared herself to be the Bab, he would have believed her, but he couldn’t understand her devotion to this “Shirazi lad” as he referred to the Bab. She told her father that she had come to her faith through reasoned consideration. This enraged her eldest uncle, the powerful cleric Mullah Taqi who cursed the Bab and then struck her. She uttered the warning that she saw his mouth filled with blood. Tahirih moved into her brother’s house holding classes for women. She corresponded with the Bab who was imprisoned in the stone fortress of Mahku in the far northwest of Persia. Tahirih’s estranged husband asked her to return to his home but she replied that she could have changed his unbelief into belief had he stood by her, but he hadn’t. Now, because he had rejected the religion of God, she was casting him out of her life forever and, in so doing, divorcing herself from him. On her return home in the spring of 1847, Tahirih stopped in the important city of Hamadanwhere she touched off conversions to the new faith in the important Jewish community there. By the turn of the century, Hamadan had the largest group of Baha’is of Jewish background in Persia. When she had been in Baghdad, Tahirih debated from behind a curtain a group of Muslim clerics. A Jewish doctor, Hakim Masih, who was accompanying the King of Persia to the holy cities of Iraq, was there and was swayed by her logical arguments expressed with such force and became a believer. Since he had never heard of the Bab, he thought this woman was the Promised One. When he returned to Tihran, he treated a prisoner who was a Babi and a survivor of Fort Tabarsi who taught him about Tahirih and the Bab. Through Masih’s subsequent teaching, many Jews became Babis. At the demand of her father, Tahirih left Baghdad for her home in Qazvin in the Spring of 1847, accompanied by about thirty of her followers, including Persians, Arabs, and women. In each town, she taught fearlessly about the appearance of a new revelation from God and met with both threats and enthusiastic acceptance. In the village of Karand, hundreds of people—many of whom were Kurds—gave Tahirih their allegiance and volunteered to serve as her personal. In these villages of Western Iran, many people followed a religion from the 15th-century CE, called Ahl-e Haqq. This religion whose central rituals were secret for reasons of protection is based on the teachings of Sultan Shak, a Kurdish spiritual teacher born in Northern Iraq who migrated to Iran and his holy book the Kalam-e Saranjam. Among the teachings of Ahl-e Haqq is the concept that God makes Himself incarnate in successive Manifestations so Tahirih’s claims about the Bab may have resonated with its followers. Similarly to Hinduism, there is a belief in the transmigration of souls, and that the human soul is reborn in successive physical bodies in its quest for ultimate perfection. This religion is practiced today mostly in Western Iran and Northern and Eastern Iraq. Click below for some beautiful music from this religious tradition and a short TED talk on the Kurds, one of the most numerous trans-national people in the world. In Karbila, Tahirih taught the Bab’s message boldly and publicly including in long letters to all the leading clerics of the city even though the written word was the province of educated men whose prerogative it was to instruct, to debate, and to explicate. She saw that few Shaykhis and Babis understood the true station and claims of the Bab who believed he was a divinely inspired reformer of Islam not the bringer of new revelation. Despite the opposition, Tahirih gathered a group of fervent followers around her, ‘the Qurratiya’, which included both male and female and Persian and Arab. One of the Arab men became the first martyr for the new religion on Persian soil. Women were attracted to her radical teachings and the possibilities that these created. Her most devoted students carried these new ideas beyond Karbila. Tahirih insisted that her followers observe dietary teachings that included abstaining from smoking or drinking coffee. Click below to learn about to learn more about the extraordinary life of Rabia of Basra a female Muslim mystic who was a highly influential spiritual teacher--nine-hundred years before Tahirih! In 1844, Tahirih was one of the Shaykhis who actively sought the Promised One and did not want to spend her time in theological speculation. The day of God was an imminent reality for her. It was for her brother-in-law as well. She gave him a letter written by her addressed to the Promised One. If he succeeded in finding Him he should give Him the letter. One night in the summer of 1844, Tahirih had a dream: She saw a young Siyyid—a male descendant of the Prophet Muhammad— dressed in black with a green turban, and his hands raised up in prayer. The words he spoke stayed with her. The Bab was the Primal Point from which all came into being, and His apostles were the Letters that originated from that Point. The Bab and the eighteen ‘Letters’ made nineteen, a ‘vahid’, or unity, signifying the unity of God; it is also the numerical value of the opening invocation of the Qur’an. Though Tahirih never actually met the Bab in person, what confirmed her faith was reading a copy of a text revealed by Him. Tahirih recognized immediately that this commentary contained the very same words she had heard in her dream. She was now certain she had found the object of her spiritual search—the Promised One of the age as foretold by her Shaykhi spiritual teachers. Click below for a superb documentary on the world of the Apostles of Jesus and read on for a further explanation of the theological Babi terms above. “The term "Letters of the Living" is both a title and a theological statement. The expression comprises two Arabic words: hurúf (singular: harf), meaning "letters," and hayy, meaning "the living." The combination hurúf-i-hayy is new; it does not occur in the Islamic scriptures. In His early writings, the Báb also referred to His first disciples by the word sábiqún or sábiqín (the forerunners), which stems from Islamic Traditions and texts. William Miller as profoundly disappointed at not seeing the returned Christ in March, 1844. Halfway around the world in Persia, Mullah Husayn, a young Muslim cleric, was also on a spiritual quest. A follower of the Shaykhis, an Islamic movement that believed that the time of the fulfillment of Islam was at hand, Mullah Husayn had been taught by his teacher that a holy figure had appeared in the world who would fulfill Islam. After his teacher’s passing, Mulla Husayn secluded himself in the Great Mosque at Kufa, south of Baghdad. He wanted to prepare himself for his quest by praying and fasting for forty days and forty nights. Mulla Husayn’s prayers led him to Shiraz, the ancient Persian city of poets and gardens. To enter Shiraz in those days, one had to pass through a large ornate gate where people met up with one another. Mulla Husayn arrived at the gate having sent his companions ahead to find a place to stay when a young man walked up to him and greeted him warmly. He wore a green turban, the sign that he was a ‘siyyid,’ a descendant of the prophet Muhammad. His name was Siyyid Ali Muhammad. Mulla Husayn thought he was a fellow Shaykhi who had come out to greet him. Siyyid Ali Muhammad invited him to his home for dinner. Shocked by this answer, Mulla Husayn presented one of his theological essays as a test to this young man who briefly looked over the intricate points and revealed the deeper meanings which Mulla Husayn had not understood. Then he offered to write a commentary on the Qur’anic chapter about Joseph. Mulla Husayn was stunned by this because his teacher had told him that only the Promised One would be capable of doing this. “What hath God wrought?” is the question Samuel F.B. Morse typed out on the simple hobbled together telegraph machine in the chambers of the Supreme Court in Washington D.C., on May 24th, 1844. He chose the phrase because the woman he was in loved had suggested it. A few seconds later, a message was received in return all the way from Baltimore. The communication age was underway. The 1800’s were years of rapid industrial development in the United States. Finished by 1869, the Transcontinental Railroad joined the two coasts, and the continent could be crossed in a matter of little more than a week whereas it had taken months. In the 1800s−only Philadelphia and New York City had populations of more than 25,000 people—became an industrial superpower during the 1800s. Its territory increased four-hundred percent from roughly 1,000,000 square miles to almost four million, and its population grew ten-fold from seven million people in 1810, to seventy million by 1890. The nation’s frenetic pace of growth accelerated social change which caused great anxiety. Many Christians saw God’s Hand at work and sought certainty in a more powerful sense of faith. Joseph Smith founded a new form of Christianity that would develop into a huge international Christian Church, the Church of Jesus-Christ of the Latter-Day Saints, which sought a purer, ‘restored’ form of Christianity. A New York farmer, William Miller, came to believe that by 1844, the Second Coming was at hand and his numerous followers became the Seventh-Day Adventist Church. Click below for more information about the Mormons, the Millerites, and the Transcontinental Railroad. Early in her marriage, Tahirih moved with her husband to the holy city of Karbila in the hot Mesopotamian plain of Iraq so he could pursue his religious studies. Iraq was a province of the Ottoman Empire in those days but several of its cities were sacred to the Shi'a, the dominant religious group in Persia, so there was a lot of travel between Persia and Iraq for religious purposes. This city was of great spiritual importance for Muslims because it was associated with the Third Imam, Husayn, who was buried there. Over the centuries, the city grew wealthy and was built up around his golden domed Shrine as generations of pilgrims arrived and elderly people sought to be buried near his remains. In the Battle of Karbila, In 680 AD, Husayn and seventy of his companions were massacred by troops sent by the caliph whose authority he publicly rejected. He came to be seen in Islam as a figure of great spiritual purity in a corrupt world who had the courage to stand to tyranny and oppression. His martyrdom colored the Shi'a religfious experience with a particular intense fervor. The drama of Husayn's death at Karbila is the centerpiece of Shi'a religious imagination. His martyrdom is commemorated every year by the Shi’a on the Day of Ashura with public displays of passionate religious feeling. The day is one of mourning for Shi'a and seen by Sunnis as a day of victory to celebrate God's victory over the powers of the world. Tahirih and her husband lived for thirteen years in Karbila where she gave birth to her two sons there. When these sons were mentioned in future Shi’a biographies, they were designated by one of her titles ‘al-Qurat ul-Ayn’ not that of her husband—evidence of the great respect in which her learning had been held. Tahirih was married to her cousin when she was a teenager which was the socially expected course for a young woman. Marriages were typically arranged by the parents and a bride price paid to the bride though, in practice, it was often taken by her family. The new couple would have spent little time together prior to the nuptials. In many cases the groom only saw his wife’s face at the ceremony. There was no such as modern Western notions of dating as men and women were separate in the public sphere. This was less true of women who lived in nomadic tribes that lived in rural areas where men and women were much more interdependent. The marriage ceremony itself involved a complex exchange of gifts based on social status and wealth. Men and women separated in separate areas after which the young couple spent their first nights together and produced evidence of the bride’s virginity. The new wife became subsumed into her husband’s family and took her place in the hierarchy of ladies. The purpose of the union was to join the families socially and economically and produce sons. The wife was expected to conform entirely to her husband’s ideas and not take a public role. Tahirih would do just the opposite. View photos of the lives of women in Qajar period HERE. Video montage of photos of 19th c. Iran by Russian photographer Antoin Sevrugin by clicking HERE. Tahirih of Qazvin was fortunate to have been born to a father, Mullah Salih, who valued the education of his numerous daughter and a mother, Amina, who herself along with several female relatives were highly educated . The men in her family were all educated clerics, several of whom had risen to the rank of 'mujtahid.' They were active participants in the theological disputes and business concerns of their bustling city of Qazvin in northwestern Iran. Education was a rarity in 19th century Persia where over 90% of the population was kept illiterate.--much less the education of women whose lives were spent in the private sphere. Only men led public lives. Fortunately for Tahirih, her father had founded a school which drew hundreds of students from as far away as India and that included a section for girls. Armed with a superb mind shaped by an excellent education and propelled by a strong and independent spirit, her destiny would be a life played out in public..
She studied religious jurisprudence and its principles, Islamic traditions, and Qur’anic commentary with her uncles--she memorized the Qur'an---learned Trukish along with Arabic,, and Persian literature and poetry with her mother. Persia's rich literary tradition remains popular in the West. Click here for a fresh modern translation of Attar's the Conference of the Birds in which--Baha'is may be interested to note, the birds travel through seven valleys. Click here that to see photos of women in 19th century Iran. Her answer was given with a solemn power of voice, peculiar to herself, that hushed everyone in the room. “Well, you couldn’t have a better one,” said one of the ministers…"
One of Rev. Beecher's talented daughters, Harriett Beecher Stowe, wrote a novel about slavery, 'Uncle Tom's Cabin', soon after the death to cholera of her own young son. Though the book is not a realistic depiction of slavery--Stowe had never seen it first hand--it was the first time slaves had been humanized in a fictional work by a white author. In addition, 'Christian love'--an idea that resonated with many white churchgoing Americans--was embodied in the person of Uncle Tom. The book became the biggest selling American novel of the 19th century and helped to sway white public opinion against slavery in the Civil War years.